The Christian religious rite of sprinkling water on to a person’s forehead or of immersing them in water, symbolizing purification or regeneration and admission to the Christian Church. That’s Google’s best attempt at describing ‘baptism’. In Westminster Chapel it is the public act of declaring your life to God. Leaving your old ways behind you and fully committing to the life God has planned for you. We heard some very emotional testimonies from the eight that were baptised, including Benedict (pictured), who’s in my Life Group, and Jen who I met at Chapel about a year ago. 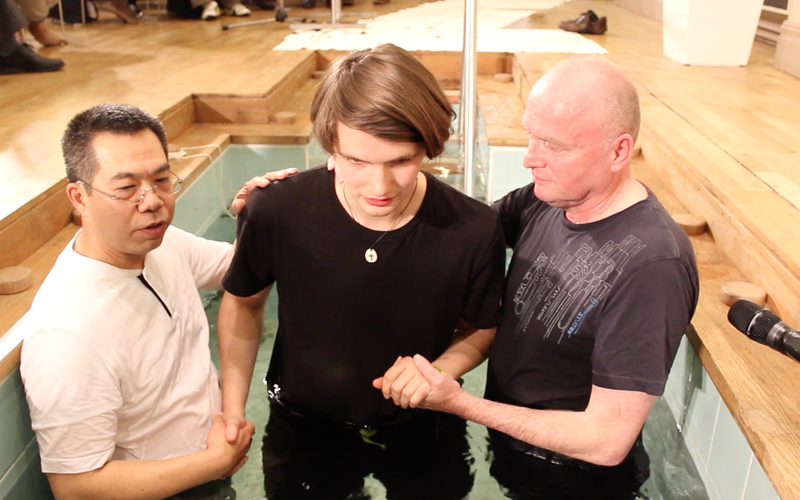 It is fantastic to see those you care about get baptised and publicly declare their obedience to God. As one of the first weeks of officially being the Tech Team leader, I took it upon myself to improve the quality of video at the service and thus took along my Canon 600D and we projected it upon the screen so everyone could see what was going on down the front. I also recorded all the baptisms and this is a screenshot of Benedict’s. Also, I was playing some worship songs, performed in the Ska genre, and this is one of them. The band Sounds of Salvation performed at KingsStock and it was so much fun to hear and see them perform!